The artificial ice skating trail at Colonel Samuel Smith Park is now open. Located just south of the Power House, this is a feature we tried to keep out of the park. After losing that fight, we then worked to minimize it’s impact on the natural environment. You can read more about our concerns and the compromises proposed & reached here. There is an indoor skate changing area and washrooms, but no skate sharpening or skate rentals. For more information, visit the City of Toronto Outdoor Rinks Page. or the City Rinks wiki. The issue of moving the parking lots in the Marie Curtis Park revitalization has now become the subject of a petition by local residents oposed to the proposed relocation of parking..
CCFEW supports the principle of moving parking away from the creek where possible and locating it closer to the streets. This serves the dual goals of protecting water quality and increasing visibility of parking lots to enhance public safety. The parking lot on the west side of the creek includes a boat launch, which by definition must be at the water’s edge. We will be working with the City and TRCA to ensure that run-off from this lot into the creek is minimized in the detailed design phase. Click here to learn more about Marie Curtis Park. With the new ice skating trail set to open in Sam Smith Park later this week, it seemed like time to remove the “Proposed Skating Trail at Sam Smith Park” page from the navigation menus. If you want the history, there are still links in the “What’s Up” archives and a link from the Sam Smith Park page. Time will tell if our concerns over its ongoing viability were justified. There were several complaints at the Marie Curtis Park meeting that we weren’t seeing what was planned for the Arsenal Lands next door. Although a master plan was developed and approved several years ago, the scope of those plans has increased and the City of Mississauga isn’t ready to share a new plan with the public yet. You can keep track of those plans on the Inspiration Lakeview website. And on the Toronto side, please get you Marie Curtis Park comments in by November 19th! The Friends of Sam Smith Blog reports today that Public School Trustee Candidate Andy Kyriakos has come out in support of a nature education centre at the Colonel Samuel Smith Park Power House. That has been a goal of both CCFEW and FOSS for many years. Former Toronto Chief Planner, Paul Bedford, gave a very interesting presentation at the Lakeshore Planning Council’s annual general meeting last week. He had some very interesting and timely ideas about city planning and municipal governance. Toronto’s not the worst, but we could certainly learn some lessons from other major cities. For a more detailed report, read Tamara Shephard’s coverage in Etobicoke Guardian. Election signs sprouted on lawns all over Toronto this morning (the first day it was legal). The mayoral race gets lots of attention, but the council races get largely ignored even though they have a significant influence on local communities. We want to work with whoever wins, so we don’t take sides, but we urge everyone to get informed and vote! For information on where to vote and more, visit the city’s Toronto Votes website. The City of Toronto has issued a request for proposals (RFP) for a consultant to provide a detailed implementation strategy for the Mimico-By-The-Lake Revitalization Action Plan. You can view the full RFP here. You can read more about Mimico 20/20 here. As reported yesterday by the Etobicoke Guardian, ground has finally been broken for the Skateboard Park in the Eighth Street Parkette. This facility has had a long and controversial history since 2006, when the City decided it should be located in Sam Smith Park. It’s good to see it finally getting underway. A digital version of our April Newsletter is now on line. This newsletter was mailed to our members in mid April. Click here to read the newsletter, or better yet, click here for membership information so that you will get next the next one mailed to you! That CCFEW supports and endorses public acquisition of any properties along the Lake Ontario Waterfront, the Humber River and the Etobicoke and Mimico Creeks that will expand and enhance public ownership and access to the Lake in Etobicoke and the Etobicoke-Mimico Watershed system. This is essentially one of the core goals when CCFEW was founded over 20 years ago but it seems worth formalizing because we are continually faced with the same issue in different locations. It is currently in the forefront again because of the development proposal at 51 Lake Shore Drive. The TRCA have begun work on a new wetland pond at the mouth of Mimico Creek. This one is on the east side, downstream from the footbridge. It will look and function much like the smaller one north of the footbridge, on the other side of the creek. Here are some photos from last weekend. On Saturday, February 27, a group of local residents filled the meeting room at the New Toronto Library to participate in a design charette for the rejuvenation of Rotary (Peace) Park. The group shared a lot of good ideas and there was general consensus for a greener, more naturalized park as well as for “daylighting” the mouth of Jackson Creek. This creek originally started near Bloor Street and emptied into Lake Ontario in this park at the foot of Tenth Street. It has been buried in a pipe for over 60 years. You can still see it’s path through the “swale” at the North-east portion of Colonel Samuel Smith Park. You can find our more about this creek and others on Michael Harrison’s Lost Creeks of South Etobicoke blog. Another chapter in the continuing saga of 51 Lake Shore Drive was written last week. Back in November, the OMB hearing was adjourned until the owner could establish the true boundaries of his property. He responded by applying to the provincial land registrar for absolute title to the property as shown on a 2009 survey. Title was questioned at the OMB hearing due to a significant discrepancy between the 1909 survey and the 2006 survey of the property The discrepancy arises from a change in the Lake Ontario shoreline. This suggests that a significant amount of lake filling has occurred since 1909. There has been no clear evidence presented to date establishing who filled the lake, when it was done, or by whom it was done. It is our contention however, that since the lake bed was publicly owned, the filled land created above it is also public. The lake was filled by an owner of 51 Lake Shore Drive. This would be illegal and therefore the current owner should not be given title. The lake was filled by the municipality or a government agency in response to an erosion event. If a public body of water was filled at public expense, there is no reason to believe that the resulting land should not also be public. It is CCFEW's position that public access to and ownership of the waterfront should be promoted wherever possible. In this instance, where there is strong evidence to support the contention that it is already in the public realm, it should not be allowed to slip into private ownership. Experience has shown that acquiring public ownership of the waterfront is costly and time consuming. We strongly urge you to reject this application for absolute title. If we are successful with this argument, it may change the picture of what’s private and what’s public along much of our waterfront. Although this is an extreme case, it is far from the only instance where lake filling has occurred. You can read the full text of our letter here. Scroll down the page for past installments of the story. In general, CCFEW is highly supportive of this initiative and appreciates the efforts being made by the City of Toronto. We understand that a number of solutions ranging from Wet Ponds to Storage Tanks to High Rate Treatment facilities are being considered. As an environment group representing south Etobicoke we are supportive of more natural processes rather than engineered solutions. During the process of implementing any recommendations coming from the Environmental Assessment process we would like the City to consider the opportunities to enhance, improve and resolve other community issues during the construction of any natural or engineered solutions. We believe that, not only can the City improve water quality through the implementation of the management of stormwater, that other community benefits can be derived at the same time. 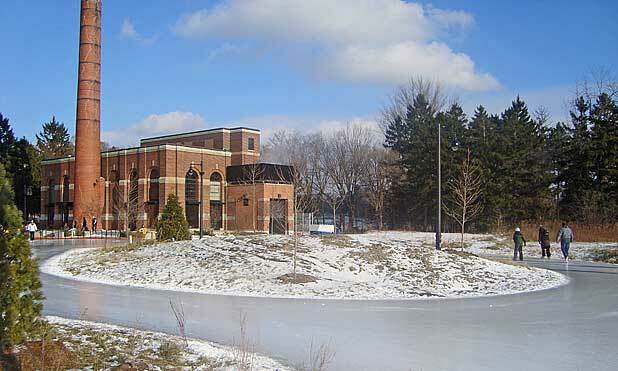 We do not support any systems or facilities at this location as we believe that parts of the old New Toronto pumping station are buried underground and recommend that Rotary Park be considered instead. At this location we would ask the City to consider placing any storage tanks under the parking lot or the ice pad. list of identified locations. As we understand that a large sewer pipe will need to be installed along Lakeshore Boulevard we would recommend using this main sewer to take the water over to the Humber Bay Park into a wetland, hybrid pond-wetland or flow balance system. We do not support any stormwater management facilities at this location. We would suggest that the City consider placing a tank under the tennis court facility adjacent to the park, or under a parking lot at one of the nearby schools. We would recommend that any new systems in this park should be a wet pond, constructed wetland or hybrid pond-wetland. We also believe that public access to the area currently fenced off for the yacht clubs private uses should be re-configured to allow for public access similar to the arrangement in Sam Smith Park for the Lakeshore Yacht Club. We would like the City to consider an opportunity to use this park and Lake Promenade for a stormwater facility. There are speeding issues along Lake Promenade and we would like to suggest the removal of the current road which could be used for a storage pipe or tank with a pedestrian-bicycle trail on the surface. We believe this would reduce the speeding traffic, create a larger park area, and better public-pedestrian access to the waterfront. Obviously the parking for tenants would need to be appropriately dealt with by access at one corner on Lake Promenade. We would like to review this with the staff at your convenience. We would recommend that Marie Curtis be considered. The parking lot on the east side of the park should be removed from the creek edge and located near 42nd Street. A storage tank could be placed underneath. This would immediately remove any oil and contamination from cars from washing directly into the creek. A new parking lot needs to be built and a stormwater facility could be built at the same time. To view our whole letter, click here.